Farah Diba Pahlavi has spent almost thirty years in exile but she cannot forget the night of 23rd March 1980 when an Evergreen Airlines DC9 in which she was travelling stopped over in the Azores. Officially it was a refuelling stop but the aircraft was held up for several hours on the tarmac without permission to take off. 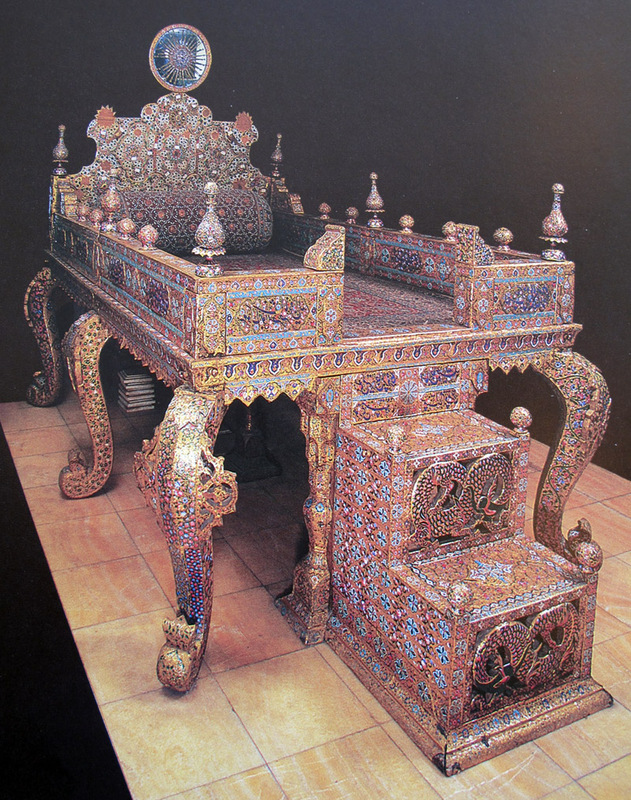 ‘It was an anxious moment,’ the last Empress of Persia tells me during a rare interview by e-mail. We have to go back in time to understand what actually happened at Lajes Air Force Base, and which could have changed the course of history. 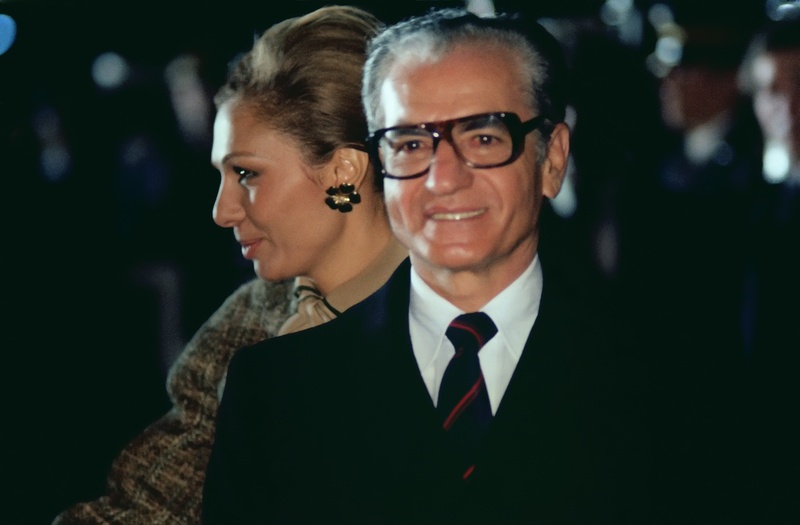 Farah Diba and her husband, Shah Mohammad Reza Pahlavi, had been forced to leave Panama and they should have gone on to Cairo where President Anwar el-Sadat had renewed his offer of refuge. They had been fleeing for over a year. Several doors had been closed to them after Ayatollah Khomeini had overthrown the monarchy. Egypt had been the first stop in their exile on 16th January 1979 when the imperial couple arrived in Aswan. But on the 22nd, Farah Pahlavi and the “king of kings”, who was suffering from terminal lymphoma, “a well-guarded secret since 1974,” were already on their way to Morocco at the invitation of King Hassan II. Their stay in Morocco, where their children who had joined them from the United States, became threatened when the Iranian masses began to demand the return of the Emperor to be tried, and perhaps to be summarily executed. This had already happened to hundreds of Army officers of the previous regime. On 14th February, the U.S. Embassy in Tehran was temporarily occupied by Revolutionary Guards. A French secret service emissary arrived at King Hassan’s Palace in Rabat to warn that Khomeini had ordered the kidnapping of members of the Moroccan royal family in exchange for his guests. King Hassan II put his private plane at the Pahlavi’s disposal. It was in this aircraft that the Shah, the Shahbanu and the children (Reza, Fahranaz, Ali-Reza and Leila) as well as a paediatrician, a governess, several colonels and the Emperor’s “personal man-servant” left on 30th March 1979 for Nassau, capital of the Bahamas. The archipelago did not have diplomatic relations with Iran but the offer of asylum, obtained thanks to Henry Kissinger, David Rockefeller and Jimmy Carter, had a time limit: three months. Three weeks before the visas expired, the Bahamian authorities said they would not renew the visas. But at the request of Henry Kissinger, Mexico, under José López Portillo, agreed to accept the unwanted family. On 10th June 1979, Farah Diba, Mohammed Reza and the accompanying party settled into Cuernavaca in the south, in a house with a tropical garden and boasting scorpions on the walls. This was the fourth site of exile in less than six months. The Emperor’s health was worsening and since Mexico did not possess modern medical facilities for cancer treatment and haematology, his doctors decided that he should go into hospital in the United States. The Shahbanu was saddened: “There was something rather vexing about being allowed into the United States after it had refused us hospitality.” She also feared hostile demonstrations but Mohammed Reza’s family and particularly his twin sister, Ashraf, decided that he should be moved to New York where she lived. They arrived there on 23rd October 1979 but before they landed, President Carter called a meeting on the 19th of his inner cabinet. Those present were: Walter Mondale, Cyrus Vance, Zbigniew Brzezinski, Harold Brown and Hamilton Jordan. This fear, or presentiment, was justified. On 4th November 1979 Islamic students attacked and occupied what they called the U.S. ”nest of spies” in Teheran and held 60 Embassy staff hostage – 52 of them during 444 days. The Iranian Republic refused to believe that the Shah was really ill. They suspected that Washington was preparing to help him back into power as it had done in 1953 when the CIA overthrew Mohammed Mossadegh’s government and put Mohammed Reza back on the Peacock Throne. Mossadegh’s fall was due to the fact that he had dared to nationalise the Anglo-Iranian Oil Company and this action had greatly annoyed Winston Churchill. Today many political analysts, including the CIA, agree that because British and Americans feared he might become an ally of the U.S.S.R., this situation later opened the path for the rise of Khomeini. On the day following his arrival in New York, on 24th October 1979, Mohammed Reza Pahlavi underwent surgery that did not work out well. The news of his internment spread quickly. He was able to hear through the window of the hospital, where he was fighting for his life, the shouts of the demonstrators crying, “Death to the Shah!”. On 20th November, after some of the hostages had been released, (only the Afro-Americans) from the US Embassy in Tehran, Carter threatened to intervene militarily. On 28th he stated he would not give in to blackmail to those who demanded the extradition of the Emperor. He would only leave the U.S. when he had recovered. When the doctors decided the patient was ready to leave hospital, the return trip to Cuernavaca was booked for 2nd December. On the 30th November, however, President Portillo refused him asylum. According to Farah Pahlavi the price for this turnaround was Fidel Castro’s promise that Cuba would vote in favour of Mexico’s entry onto the UN Security Council if it did not allow the Shah to enter the country. The Carter Administration had no other solution than to discreetly send the Persian Royal Family to Lackland Air Force Base in Texas. It was a temporary stay that the State Department had no desire in prolonging. Even South Africa, where apartheid still governed, refused asylum. 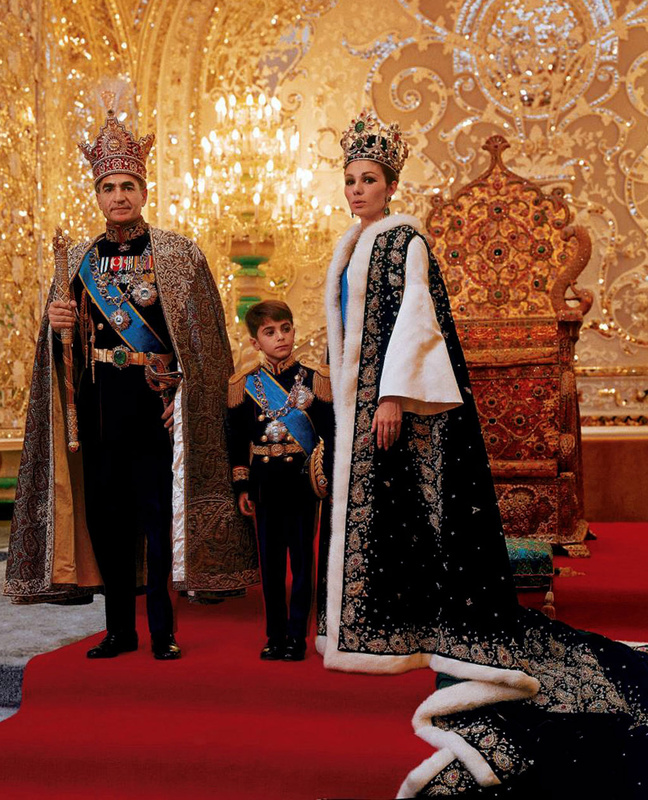 ‘We felt we were outcasts,’ complained Farah Pahlavi. On 12th December 1979, General Omar Torrijos, “Supreme Commander of the Government” agreed to allow the Pahlavis into Panama. He installed them in a four-room villa on the Island of Contadora. Three months later, Torrijos it appears, was persuaded by Sadegh Ghotbzadeh, “that he conspired to be Iranian President” and that his house arrest would be sufficient for the Iranian students to release the US hostages. The Shah and the Shahbanu left for Cairo at 2 p.m. local time on Sunday, 23rd March. That night the Evergreen Air Lines charter company DC9 made a fuel stop at Lajes in the Azores. After waiting for one hour Farah Diba began to fear the worst: “Was it an attempt to stop us reaching Cairo? We were at an American airbase in an American plane, therefore everything was possible.” On asking what the problem was, the reply came back that the plane “required authorization to fly over certain territories”. Later, Farah Diba found the reason for the interminable delay. When one of the lawyers sent by Tehran to Panama was preparing to deliver an extradition request he asked the U.S. to intercept the Imperial couple’s aircraft as Saedegh Ghotbzadeh said he was convinced he could manage to free the American hostages once the announcement had been made of the detention of the royal couple. The decision to hold the aircraft at Lajes was made by Hamilton Jordan, chief of staff at the White House and a Carter confidant, although Carter himself had not been advised of it. As no encouraging news had arrived from Tehran, the aircraft was authorised to take off after a 4 hour holdup. On 24th March, when the extradition request was delivered, the Pahlavis arrived in Cairo. 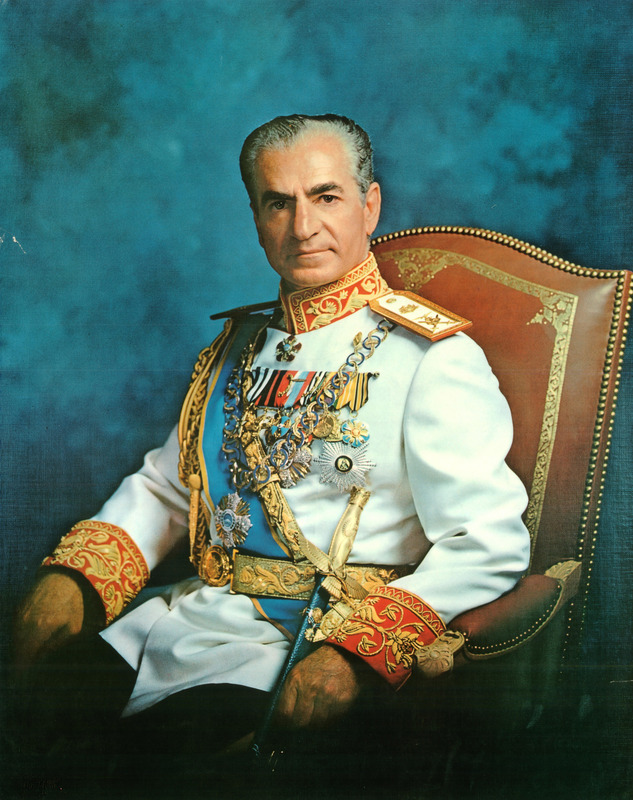 Farah Pahlavi was convinced that Torrijos “would not have hesitated to place the Shah under house surveillance.” But would that have satisfied the Iranians? Whatever the case, Mohammed Reza Pahlavi did not live for very much longer as he died on 27th July. Sadat, who had installed him in the Koubbeh Palace, gave him an imposing State funeral. The body lies in the Al Rifa’i Mosque where Farah Diba goes every year to pay tribute. On being asked officially, the American officials merely replied, “they didn’t know.” They couldn’t have replied to a sovereign state “we cannot give you any justification”, added Gonçalves Pereira, as stated by the Empress in this interview. The information that he had was that the Americans were negotiating with the Iranians, through Algiers, the handover of the Shah to the mullahs in exchange for the release of the hostages in Tehran. Supposedly, the Islamic Republic’s demand was that the aircraft carrying the Shah should deliver him to the Iranian capital. The U.S. only agreed to leave him in Algiers. So the negotiations failed”. Almost 30 years after a trip that she had hoped would have been “a temporary departure from the country,” Farah Diba is a harsh woman, in sharp contrast with the meaning of her maiden name in Farsi that means “silk”. She continues to defend the Shah’s actions and attributes his overthrow to a conspiracy. She venerates him as a visionary leader, but many however, including some of his staff, describe as being weak and indecisive. Naraghi, the sociologist, said that, on several occasions, he had tried on several occasions to explain to the technocrats surrounding the Shah that “the great civilization” desired by the Shah would lead to “a chaotic uprising”. The emperor’s policy “divided a nation, a progressive minority on the one hand and a traditionalist majority on the other – which undermined the feelings of national solidarity and exposed [the Iranians] to a completely new cultural conflict”. She does not believe that lies, material and moral corruption, flogging, stoning and dismemberment of people are part of the valuable Iranian traditions. The majority of Iranians very much wanted what ‘modern life’ offered such as schools, universities, hospitals, stadiums, libraries, cultural centres, industries, communications and their participation in the development of the nation”. But this isn’t the progress that many refer to, but rather the ostentation and the provocation shown, for example, at the Shiraz Arts Festival, Farah Diba’s personal project, inaugurated in 1967 and during the celebrations of the 2,500 years of Persepolis in 1971. In Shiraz the biggest scandal took place in 1978 when a Brazilian dance group performed explicit sexual dances. “90% of the Shiraz Festival programme consisted of traditional music, dances and theatre and perhaps some 10% of avant-garde, which doesn’t mean it was immoral,’ said the Shahbanu during this interview. In Persepolis, the first royal city of the Achaemenid Empire where vestiges of the palace of Darius I, successor of Cyrus the Great, still survive, only the rich and powerful were invited. The people were excluded. The costs were calculated at between 200 and 300 million dollars. Elizabeth Arden created a new line of cosmetics and named it Farah. Lanvin designed the servant’s attire, Maxim’s of Paris supplied the chefs and the catering. Except for the Iranian caviar, all the food was supplied from France. The Empress complained of “the exaggeration of the journalists”; she pointed out that the infrastructures would last and justified the expense as “a magnificent exercise in public relations” which helped many people to “situate Iran on the map”. The only daughter of Colonel Sohrab Diba and Farideh Ghotbi, a plebeian whom the Shah chose to guarantee his succession after two failed marriages, she presently lives between Washington, New York and Paris. Despite having opened a window of opportunity for Khomeini to launch his revolution and closed the door to Mohammad Reza when he sought asylum, France is still a country where Farah Pahlavi feels comfortable. Paris was also the city where, in 1959, Farah Diba personally met her future husband, twice divorced, in 1946 and in 1958. First from Fawsia bint Fuad, sister of King Farouk of Egypt whom he married in 1939 when he was still heir to the throne and who bore him a daughter, Shahnaz, and then from Soraya Esfandiari-Bakhtiari, “the princess with the sad eyes”, whom he met in 1948 and married in 1951. She suffered from infertility, but refused the Shah permission to have a second wife as permitted by Islam so the union was annulled. Mohammad Reza was 39 years old when he was introduced to Farah Diba, 20, at a reception in the Iranian Embassy after a meeting with Charles de Gaulle. She caused a good impression and this was enough for the Emperor’s son-in-law, Ardeshir Zahedi, Shahnaz’s husband to go ahead and deal with the details for Farah Diba to become the fiancée the Shah was seeking. An attempt to marry the king to the Catholic princess, Maria Gabriella of Savoy, was found to be ill advised by the Vatican as “a serious threat”. Farah Diba accepted the Shah’s marriage proposal on the day she celebrated her 21st birthday on 14th October. The betrothal was officially announced on 21st November. The marriage that included two ceremonies, took place on 21st December. Yves Saint-Laurent, of the House of Dior designed the wedding dress, embroidered with silver threads. The Carita sisters created a hairstyle that featured a parting in the middle and with the temples covered. This style became fashionable the world over. 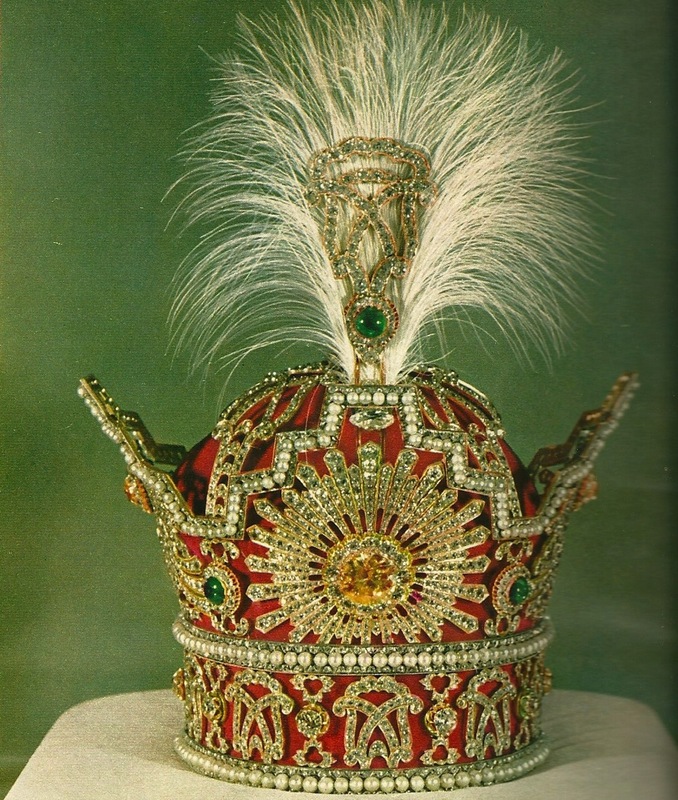 The diadem was a Crown jewel. 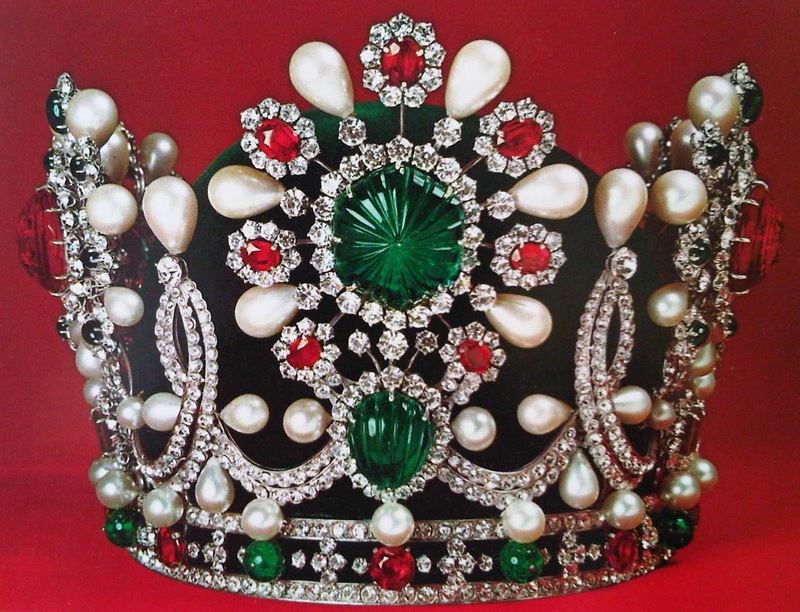 It was designed in the 50’s by the American Harry Winston, and weighed two kilos. 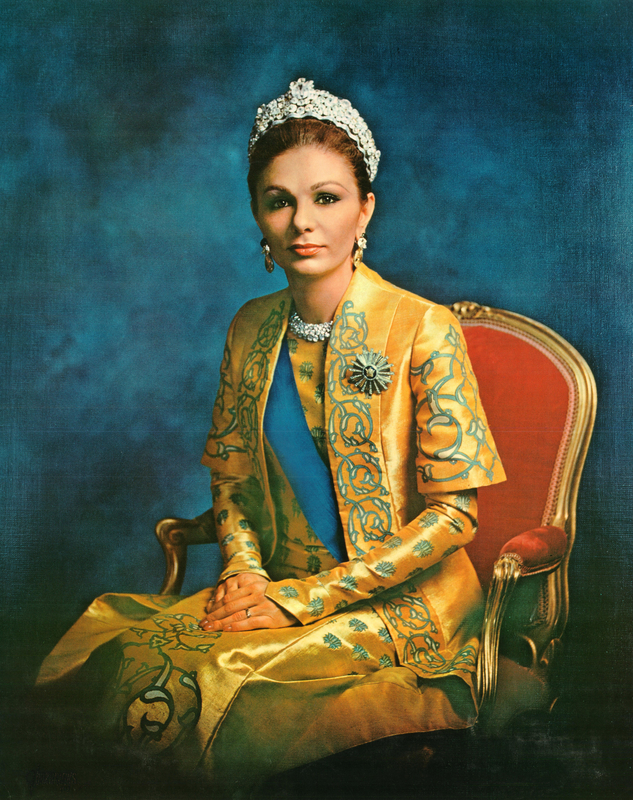 As Shahbanu, a title she received on her wedding day and which the Mullahs abolished, Farah Pahlavi led a dream life until the advent of Khomeini’s revolution. Not that she faces financial problems (although she suffered a situation of embezzlement of several million dollars). But following the death of her husband she had to face the suicide of her daughter Leila who had become a Valentino model. Suffering from a “chronic depression, low self-esteem, nervous anorexia and bulimia”, Leila took a fatal dose of “barbiturates and cocaine”, according to the autopsy. She was found dead in her London apartment in June 2001. She was 31 years old. Deprived of Leila, the Shah’s widow continued to dedicate herself to the rest of the family, particularly to the oldest son, Reza, who proclaimed himself emperor after his father’s death in Cairo. “Over the last 29 years the heir to the throne has been very active in his contacts with many of his compatriots of different ideologies both inside and outside Iran”, says Farah Pahlavi. She continues: “The regime survives by creating crises and seeking foreign enemies, to revive sentiments of nationalism. This regime must not be allowed to obtain nuclear weapons,’ She makes no appeal, however for military intervention to stop the suspected Iranian uranium enrichment programme.